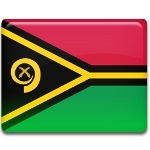 Independence Day is a public holiday in the Republic of Vanuatu celebrated on July 30. It commemorates the country's independence from the United Kingdom and France in 1980. Vanuatu is an island nation located in the South Pacific Ocean. The archipelago belongs to Oceania. It was originally inhabited by Melanesian people. In 1606, the Spanish led by the Portuguese explorer Pedro Fernandes de Queirós visited the largest island and named it Espiritu Santo. French explorer Louis Antoine de Bougainville re-discovered the islands in 1768. In 1774, the archipelago was visited by British navigator Captain James Cook who named it the New Hebrides. Both nations were interested in colonizing the archipelago. In 1906, France and the UK reached an agreement and began to administer the New Hebrides jointly, establishing the British-French Condominium. The process of decolonization began in the 1960s. Independence of the New Hebrides was proclaimed on July 30, 1980. The new republic was named Vanuatu. Vanuatu Independence Day is widely celebrated throughout the country. The biggest celebrations take place in Port Vila, the capital of Vanuatu. The festivities include a military parade, outdoor performances, and sporting competitions, such as yacht and canoe races.